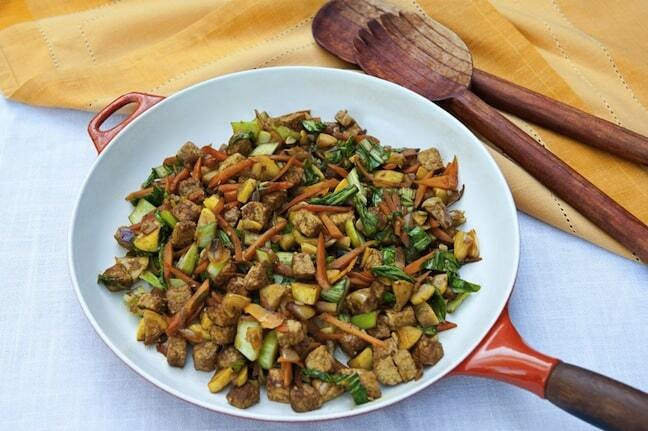 Frying tempeh in red palm oil gives it a rich flavor and meaty texture. You can use coconut oil or sesame oil and swap other seasonal vegetables for infinite tasty variations. In this recipe I used mirin, a sweet rice cooking wine, feel free to use another cooking wine or water. Serve this stir fry on top of rice and with a side of fresh pineapple for a fine meal. Copyright © 2013 Leslie Cerier. Photo by Tracey Eller. Frying tempeh in red palm oil gives it a rich flavor and meaty texture. You can use coconut oil or sesame oil and swap other seasonal vegetables for infinite tasty variations. Heat and melt the oil in a wok or large skillet over medium-high heat. Add ginger, mirin, and tamari and fry for a minute to blend flavors. Turn off the heat and stir in bok choy, which will wilt and turn bright green quickly. Taste and adjust the seasonings; add more tamari for a saltier taste, if you like.